On the Finland border, a guard checked our documents and let us in. At last we left the hell on earth called Russia; tired, sick, but full of hopes for new life. Ehhh…. We decided to apply for asylum in Sweden; we (and not only we) were sure that there is one of the most tolerant to LGBT people countries, hoping to be understood and get help. So, we headed to Stockholm by hitchhiking, because we had no enough money for a train or a bus ticket even. In two days we reached Solna Migrationsverket [the Swedish National Migration Board] in Stockholm. The first bad surprise in Sweden we got there: the reception center for asylum seekers was closed. It appeared that is no 24/7 asylum reception in Sweden. So, we spend weekends like homeless beggars: bushes instead of room, a bench and pieces of cardboard instead of bed, old papers for blanket, and bags for pillows. This all considering our health (you know already from Part I), and ambient air temperature 0°C (ZERO). You can ask, what was a necessity to live at the street, why not to ask just a first police officer for assistance, this is their service. So, remember our misadventures in Russia, especially with local police … sufferings never pass immediately, as physical as moral. Really, police offices appeared near asylum reception centre sometimes, and some people were going in and out, but nobody paid attention to us. And, we were simply afraid. On Monday, we got into asylum reception centre at last. Well, we really got rather nice attitude there. An officer registered us with IDs we had (we succeed to preserve our travel passports after all troubles in Russia) and gave us tickets to Märsta asylum centre. In Märsta, we got not so good reception. So, we were settled in a room with another family. What were executive people thinking about: firstly, to make a family to live with another one in a single room with the common bathroom; then, not to pay attention to my transgender problem. Moreover, I was totally humiliated during the procedure of registration and LMA-card issue. When I gave my IDs to an officer, he looked on it and asked me: ARE YOU A MAN? He had no as moral as official right to ask this: all employees of asylum centers are specially trained and in particular acquainted what means transsexual person or a person with transgender past. After all, in spite that he could see a lot of waiting people after me, he asked loudly: ARE YOU A MAN OR A WOMAN? (!!!) I could not withstand such insulting, the same as from Russian police! So, I left a line and sat a free chair in the corner. I was really going to get into tears. In some minutes three women came, the officers and the interpreter, and made excuses. Well, I said that I accept their apologies, but such situation must NEVER happen; and I will notify authorities, lawyers, and press about this. Despite I am the transsexual woman, I am not an illegal criminal, and I am not a wild animal for circus or zoo amusement, we had enough in bloody Russia!! After some weeks spent in Märsta, we were told to go to Gävle and wait for decision on our case. An officer warned us that, most probably, the answer will be negative and we will be deported to Finland according to Dublin agreement [the agreement amongst European Union countries to return an asylum seeker to their country of entry into the Union]. Well, what else could we do that time…? At Gävle we were totally shocked by treatment with us. Firstly: we really had to fight for any medical help. I could hardly-hardly convince a medicine man who examined our health there, that I need female hormones vitally. By the way: only one month hormonal replacement treatment (HRT) interruption for male-to-female (MtF) transgender can cause tragic consequences: from cancer to immunodeficiency disorder, and psychiatric problems as well. Then; an assigned psychologist we told our story, only listened to us and did not give any reply, except a promise to make the other appointment. So, when after 6 weeks we came to her by our own initiative, because we were tired to wait for a promised invitation, she showed a great astonishment, as if she saw us for a very first time. I FORGOT – she said, - WAIT FOR AN INVITATION. Is anybody sure that we don’t need any medical help, including psychiatric? Moreover: my friend Olga appeared to be ill with hepatitis C (for sure, a ‘gift’ from Russian bandits that kept us in sexual slavery). But, she got the necessary medical treatment in a month only! It looks like jeering at suffering people! At the same time: our new friend A., a Russian refugee man living in Stockholm that time, applied to local clinic for asylum seekers because of severe post-traumatic depression that resulted in heavy alcohol addiction, after all his troubles in Russia. And he got psychiatric assistance and therapy as well immediately, and the treatment was successful. And the real lawlessness was in so-called social support. We were informed at Migrationsverket that asylum seekers have right for welfare in amount of 71 SEK [~€7.7] per day for a single person, or 61 SEK per day for each person of a family. I.e. we had to get 122 SEK per day being a family of two persons. Imagine our feelings when we discovered only 120 SEK on each card account, for all the first month! We did not ask Migrationsverket for explanation, we believed that nobody in Sweden will do such things that are usual in Russia, and the mistake will be fixed soon. Hahahah, I laugh bitterly. Next two month we were nearly starving. Soon I began to feel liver pain being on hormonal therapy, and Olga could hardly move and turned yellow like a lemon, with her hepatitis C. And, for the second month we got the same 120 SEK per person! Our patience was over. We came to Migrationsverket and asked for explanation. Only then, they did what they must. The deficit was about 7,000 SEK!!! And, finally, about one so-phrased public organization for human rights (four letters’ designation, the first one is R). Their counselor P. promised us much by phone and e-mail, but really did nothing except telling us what we heard already: YOU HAVE NO ANY CHANCE IN SWEDEN, YOU WILL BE DEPORTED ACCORDING TO DUBLIN AGREEMENT. 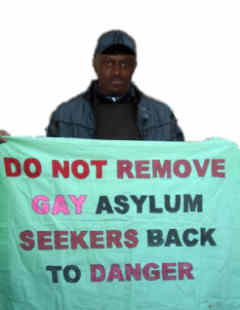 And: SEXUAL ORIENTATION IS NOT A GROUND FOR ASYLUM. Nevertheless, at the same time P. met a FtM transsexual and his wife from Kazakhstan. Even in spite they should be rejected in conformance with Dublin regulation like we, he helped them with daily allowance issue, paid a travel to Stockholm and provided them an apartment. And we got nothing, even no travel payment, unless P. knew that we have no any means for living except welfare, and we had to pay the money we saved (over 1,000 SEK) for travel from Hedemora where we were finally settled in, to Stockholm. Well, we know what Dublin agreement is about. But the one, and Geneva Convention and EU laws on asylum as well, indicate directly that an applicant can get an asylum at the country of his/her physical location, i.e. ANY country of EU, on the ground of humanitarian reasons. After five months in Sweden, we were deported to Finland. Swedish authorities refused to provide us an asylum, directly breaking EU laws and exposing our lives to danger. The next part of 'Kim' and 'Olga's story to follow. Although the authors of the Finland Country Report did not find case law to confirm that LGBT applicants have been granted asylum in Finland, they did receive anecdotal confirmation of this from the staff attorneys at the Finnish Refugee Advice Centre .